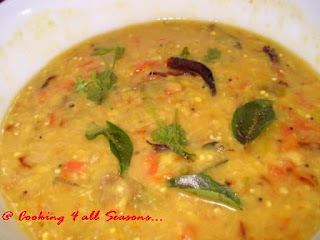 Cooking 4 all Seasons: Maamidikaya Pappu ~ Mango Dal! When I was about 8 years old, I remember my paternal grandfather saying he was going to grow mango trees in our lands. I remember being all excited about it, though actually growing Mango trees were quite a daunting task. Still he went ahead and planted them. For the next 5 years, we didn't get to hear much about the crop. But during every summer vacation, that we spent there, I remember going to visit the mango trees dutifully and expecting them to give us wonders. Andhra is known for its delicious mangos and during the season, our house will be overflowing with the bounty, though of course not ours. My grandfather, though indisposed due to physical condition, blamed the seller for cheating him of a good variety. We used to travel by train to our native place and the journey takes us through a vista of acres of Mango trees growing with abundance, making them stoop down with the weight of their crop. One look at the sight and you would probably want to grab them. So we reach our place with the same tantalizing picture in mind. No doubt ours trees would be very picturesque, expect the taste isn't something you would want to talk about back home. Sree was the only person who ever liked it. He said it tasted more like a cross between apple and orange with a slight touch of mango. Well, that was enough to throw us off it. Every year, our granny would bring them back with her but the only patron it ever had, was my brother. Thinking about those mangoes, if those golden bygone days are here again, I will gladly eat them any day. Even if it did taste like an apple orange mix. Growing up in a city that's deprived of its natural beauty, makes me long for those summer days spent in fields, trekking and running around, I feel sad for our kids. Other than a lone mango tree that peeps to our compound from our neighbouring house, they won't actually get to see a mango tree close by. And all I have, are my memories of those lovely summer days spent next to a window of a running train, to share with them. 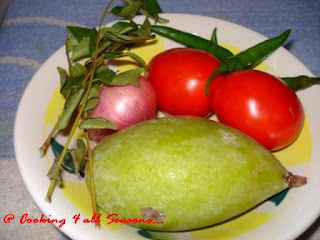 Come summer and you will see lots of tempting raw mangoes in the market. I especially love those long ones more suitable to be eaten raw. Its mostly during Ugadi, that we end up eating lot of raw mangoes. The tender raw mango makes an important part of the Ugadi pachadi. Apart from eating them raw, Amma makes a great pachadi, which my Dad is so fond of. I have never tried making it. Maybe this time round, I might finally get to it, if not for anything, atleast for my dear blog. 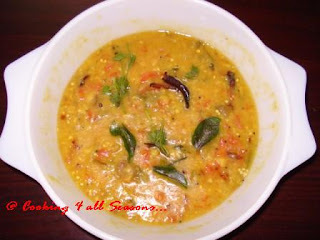 The other dish that makes use of raw mango is a pappu that Athamma makes. I came to know of this during the first time she came to live with us. With a tempting thought of eating one with salt and chilli, I had one of those raw mango. But I got busy and never got around indulgeing in that. One evening, on returning back home, remembered the mango lying in the fridge, uncared for. I reached out for it, only to be surprised to find it missing. When I asked Athamma, if she knows of the missing mango, she replied that it found its way into the pappu. With disbelief, I asked what pappu? She replied with nonchalantly, Mamidikaya Pappu! God, it was the first time I came to know that one can do a pappu with Mamidikaya too. Trust Athamma to come up with these combis. Mamidikaya pappu tastes great and makes up for a change from our regular stereotype dal with tomatoes. The two tomatoes that you see in the picture was just an addition to make the picture colourful! Take a tadka pan, heat oil, add mustard seeds, curry leaves, and garlic pods. Once they are little fried, add the chopped onions. Fry the garlic is nice brown in colour. As always the trademark of Athamma's remains in browning the garlic. That brown garlic adds lot of flavour to the dal.